How can disable OTN Support in H series? Hello, I found this option in my 48H8000 series, but not displayed. Anybody help me for disable OTN Support? Thanks @sectroyer for your work and help!! Re: How can disable OTN Support in H series? Thanks but with extended service menu don't appear that fuction. Any ideas?? zarigo wrote: Thanks but with extended service menu don't appear that fuction. Any ideas?? Did you check the place where it was on my tv? And are you sure you did enter "extended" service menu? Which method did you use? Foolowing this topic: "H series region change" viewtopic.php?f=75&t=7882&start=20 works perfecly activate menu extended. 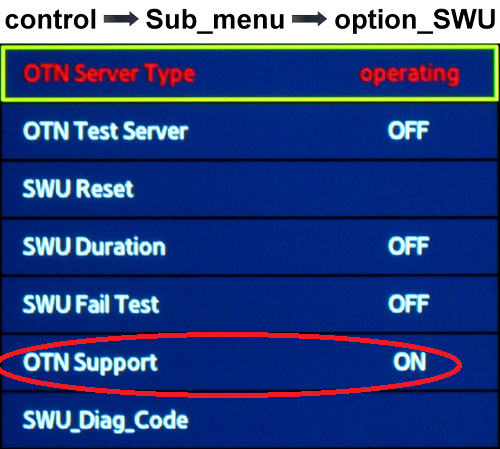 In another menu different of control->submenu->option_swu i found this: Is the same? zarigo wrote: Thanks for your answer. Could you make a photo of every menu and post it here so we can update the wiki ? sectroyer wrote: Could you make a photo of every menu and post it here so we can update the wiki ? Yes, of course my friend.